So, I fired it up. Our old projects are archived with software called Retrospect. I identified the file names I wanted to retrieve, but the drive didn’t want to connect to the computer. 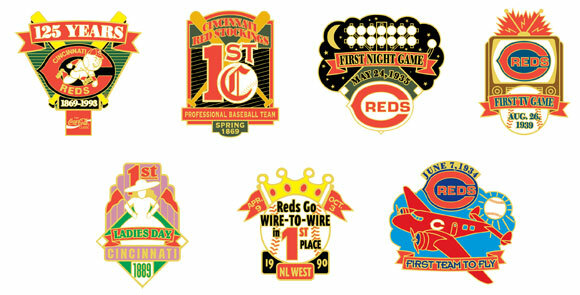 My partner, Gary, made several attempts and was finally able restore a set of baseball lapel pin designs. Although we recovered the files, the next step was to move them to my iMac. Gary copied the folder on an Iomega Zip disk (remember those?) and successfully copied them to my desktop. I was happy to have the files, but immediately discovered they were so old they wouldn’t open with our current software. These were early Freehand files; unfortunately, we had not saved them in .eps (encapsulated postscript). Arggghhh! Then it dawned on me that we still had a Freehand clip art book with a CD. Luckily, it was loaded with the application (Freehand 7.0). Again, it was not easy to connect the CD on the old computer despite repeated tries and restarts. Finally the disc connected, and we were able to install the software. Success! The old files opened quickly, and I saved them as .eps files, which could be opened with current software. Whew. At this point, I was feeling really inspired and wanted to pull up another project. But the old tape drive was fading fast. Every time I tried to restore, it blinked “hardware error.” Gary tried cleaning it with a head cleaner cassette, then with Q-tips and alcohol. He even took it apart and cleaned it again. Sadly, the tape drive just couldn’t cut it. It was dying a slow death, leaving us with a drawer full of DAT tapes. Hey, we tried! We were persistent and resourceful. We even dusted off some early computer maintenance skills that were stored in our human archives (brains). If you happen to have an old tape drive that still works, please let me know. N-K is available to design your custom lapel pin. Contact us at 314-548-6001.